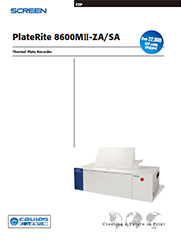 PlateRite 8600MII-ZA/SA | SCREEN Graphic Solutions Co., Ltd. The PlateRite 8600MII-ZA/SA is another high-quality thermal CtP recorder built with the renowned technology and expertise that have made Dainippon Screen the world's number one CtP anufacturer. Screen's unique thermal external drum technology is combined with its highprecision optics to enable fast and high-quality plate output. As there is no need for complex processing and intermediate steps, such as outputting layout data to film or exposing plates using film, the plate production process with CtP is much simpler than traditional platemaking. 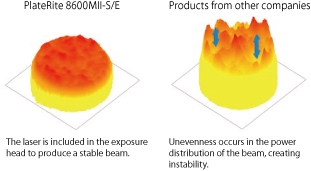 Furthermore, CtP eliminates paste-up errors and foreign-matter contamination, contributing to increased efficiency in both the platemaking and printing process. Last but not least, thermal CtP output produces sharper halftone dots than traditional platemaking methods, and therefore ramatically improves printing quality. Full-digital workflow EQUIOS (Workflow system)An EQUIOS workflow system helps to achieve maximum productivity. Linking with EQUIOS enables non-stop automation while minimizing errors and production losses. Output to a CtP recorder is also easier than ever before. Auto-balance systemThe PlateRite 8600MII features Screen's unique auto-balance system. The operator simply selects the plate size and type from the display menu and the auto-balance system automatically fine-tunes and optimizes the balance of the recording drum. This ensures stable drum rotation even at high speeds. Stable exposure beamWith the PlateRite 8600MII-ZA/SA, the exposure head and its builtin laser move as a single unit. This prevents any profile fluctuation caused by changes in the shape of the optical fiber and roduces a stable beam. *1 1,200 dpi uses 2,400 dpi double dots. *2 Over four consecutive exposures on one plate at 23°C (73.4°F) and 60% relative humidity. *3 Productivity may vary depending upon media sensitivity. *4 Productivity is calculated so it includes 10 seconds for loading and unloading per plate.